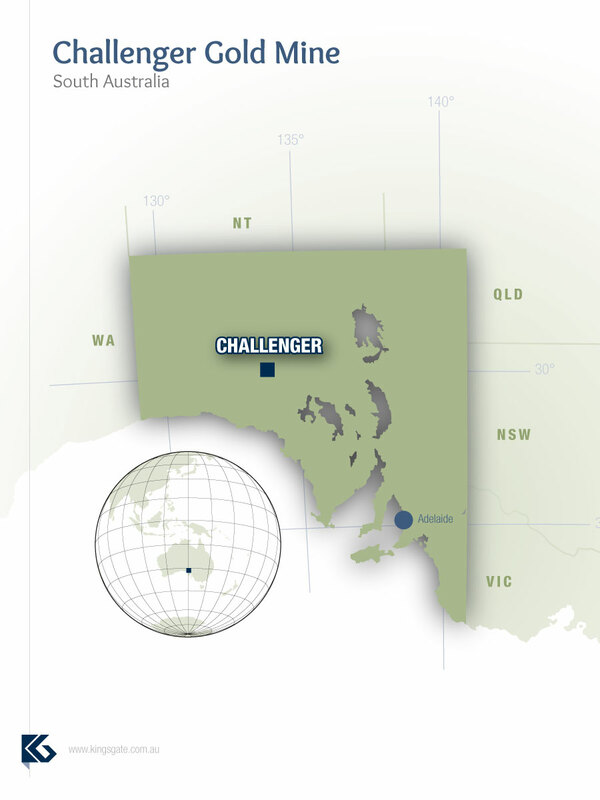 The Challenger gold deposit was a virgin gold discovery made by Dominion Mining Limited in May 1995. Open pit mining commenced in mid-2002 and plant and infrastructure was completed during the September 2002 Quarter. Plant commissioning commenced, on schedule, in late September 2002 and the first shipment of gold bullion was completed on 24 October 2002. Mining of the Stage 1 open pit and small adjacent auxiliary pit was completed by April 2004, to the final planned design depth of 125 metres below surface. Underground development commenced in February 2004, with the construction of a decline and associated surface facilities adjacent to the open pit. Underground development continued throughout 2004, enabling full-scale underground production to begin in mid-2005. The expansion of the project meant that four principal ore positions have been identified at Challenger – the M1, M2 and M3 lodes and the M1 Shadow Zone. Underground production has historically focused on mining of the M1, M2 and M3 lodes which have proved challenging in their structural configurations. With this in mind, operations have moved to the upper levels of the Challenger West lode, where the ore is contained within one single lens, and geotechnical conditions are more favourable and mining costs are lower. In 2013, Kingsgate changed the strategic direction of the mine in order to revise and restructure the cost base and maximise the production profile and operating cashflow. This included appointing a new mining contractor, Byrnecut, and transitioning to a new operating plan focusing primarily on the higher grade Challenger West orebody and implementing the “Challenger Lean Program”. Benefits of this initiative were highlighted in results for the December 2013 quarter, with gold production of 20,318 ounces being at the highest level for seven quarters, and total operating costs being 17% lower than the September 2013 quarter.